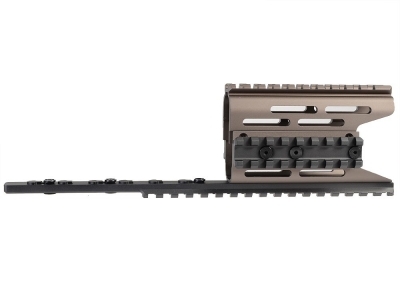 AK Modular / KeyMod Handguard Rail -TRAX 2 for GHK / E&L AK Series. 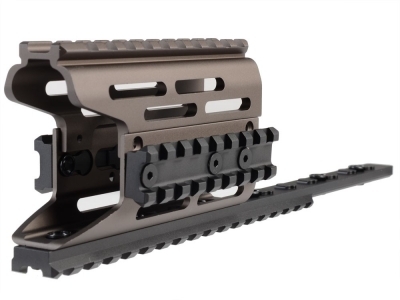 The Strike Industries AK TRAX rail system is a modular drop in rail that is versatile, light-weight, and durable. Made from solid T-6 anodized aluminum materials, the TRAX won’t add much extra weight but it will provide an adaptable platform for the user to mount their accessories. The TRAX can be constructed in a number of configurations to give the user the most selection and control of their hand guard rail. 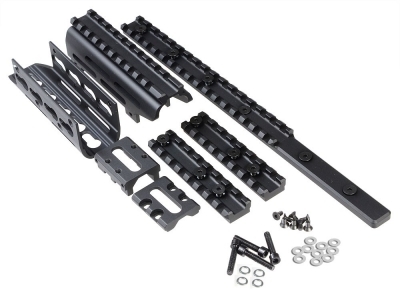 Additionally, by utilizing the keymod system, the user can place rail sections for accessories at their discretion. The TRAX 2 section is the front rail that covers the gas block. You can choose to utilize just the bottom portion of TRAX 2 and leave the gas block exposed or connect the top portion to complete the entire section. Combining TRAX 1 and TRAX 2 gets you the maximum amount of modularity and real estate for your tactical accessories!